"The policies and procedures in place to prevent youth vaping clearly haven't worked," said Richard Miech, the survey's lead author. "Vaping is reversing hard-fought declines in the number of adolescents who use nicotine... These results suggest that vaping is leading youth into nicotine use and nicotine addiction, not away from it." The decline in cigarette smoking by teens showed some interruption this year. "Factors that make vaping so attractive to youth include its novelty and the easy concealability of the latest vaping devices, which better allows youth to vape without adults knowing about it," Mr Miech added. The appeal of e-cigarettes to teens is widespread and has raised alarm in other countries too, including the UK. Many believe vaping leads to cigarette use and warn of possible long-term health consequences. But there is little consensus about how to regulate the industry. 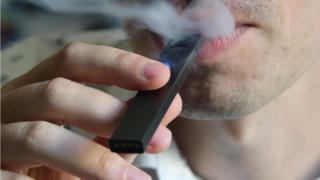 The US Food and Drug Administration (FDA) said in September there was an "epidemic" of use of flavoured e-cigarettes among teens.